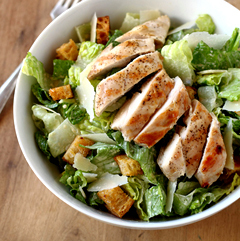 Slices of freshly grilled chicken breast served on romaine lettuce hearts tossed with classic Caesar dressing, freshly grated Parmesan cheese and croutons. 1. Defrost chicken breasts either in refrigerator for 24 hours, or in a large bowl of cool water while still in vacuum-sealed package. 2. Remove breasts from package, rinse and dry thoroughly with paper towels or clean dish towel. Coat on both sides with seasoning. 3. Read Perfect Chicken Breasts for chicken grilling and pan-grilling directions. When breasts are done cooking they will need to rest 5 minutes. While they are resting, you can make the salad. 4. Remove and discard outer leaves of Romaine hearts. Tear hearts into shreds in large bowl. Add Caesar dressing and toss thoroughly. 5. Serve salad onto plates or bowls and top with grated Parmesan and croutons. 6. Slice chicken breasts into strips and place on top of salads. The seasoning for the chicken was delicious, as was the dressing. Dinner was ready in 15 minutes. Perfect.